My mom brought over a bunch of tomatoes and jalapenos from a coworker of hers the other day. She gave us some Jetstars, Big-Beefstar and Better Boys to try, all of them perfectly ripe and beautiful. Now, I’ll be honest: I’m not a fan of raw tomatoes. I love salsa and tomato sauces, I think tomatoes are great for lots of things, but eating a slice all by itself? Yecch. These, however, changed my mind. I know part of it is that for a few years, I didn’t realize I was committing tomato sacrilege by storing them with the rest of the produce in the fridge. That icky, mealy texture? Tomatoes do not belong in the fridge! When I lived near Seattle, I learned another lesson: Don’t buy the overbred varieties that have as much in common with a real tomato’s taste as an eraser. Central Market carried an heirloom called a “Bruno Rossi” that I fell in love with. There was no better tomato for salsa, as far as I was concerned, given its rich, dark flavor. Now, I’ve learned the truth: A perfectly ripe tomato that has been left to ripen naturally from a breed that hasn’t been bred to tastelessness in search of shelf life and perfect exteriors is wonderful. We sliced up a bit of a Jetstar (I think? I can’t easily tell these guys apart) for a salad. My husband tried a bit and happily announced that this was a good, ripe tomato, then offered me a bit. It was.. sweet. Juicy. Full of flavor with no hint of mealiness. It tasted like fruit (which, of course, it is). Still somewhat strange to me, so I tried it with some salt, as one is wont to do with a nice ripe tomato. Wow! Suddenly, it had depth! The sweet played counterpoint to the savory amped up by the salt. Now, that’s good! I figured these tomatoes deserved a dish that would showcase their flavor, so I suggested we try making one of my husband’s favorite summer dishes, a caprese salad, the next day for lunch. (Unsurprisingly, he agreed.) 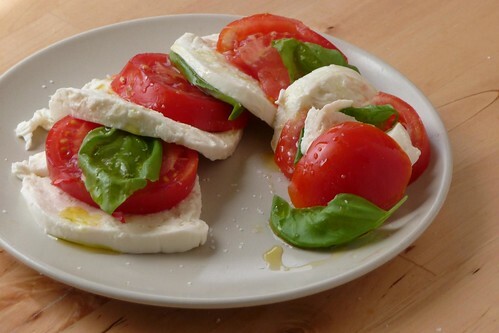 A caprese salad is a traditional Italian mix of tomatoes, basil, mozzarella, olive oil and salt. The trick to this salad is simple. Do not make it unless you have perfectly ripe and tasty tomatoes, preferably from someone you know that just picked them within a day. There’s no way I would even consider making this with the tomatoes from the store that are ripened using gas, as the flavor and texture are just not that good. I think I prefer the slices best. It allows you to easily get a bite with all of the components at once and I really liked the softness of the first cheese I tried. Either way, both are excellent and worth a spot on your summer picnic. Slice tomatoes into thickish slices. Slice mozzarella into similarly sized slices. Arrange slices on plates, interleaving with basil. Drizzle lightly with olive oil and sprinkle with salt. 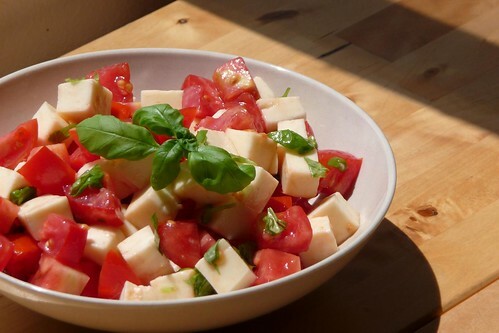 Chop tomatoes and mozzarella into similarly-sized cubes. Slice basil into ribbons. Toss with olive oil and salt in a medium bowl, then serve. Giada de Laurentiis had a neat variation using toasted slices of french bread rubbed with a bit of garlic and topped with the caprese components. I served mine with a slice of Wasa crispbread and half of an avocado. Perfect lunch. This entry was posted in gluten-free, italian, recipes, salad, untranslated, vegetable, vegetarian. Bookmark the permalink.